WEST LAFAYETTE, Ind. - Researchers are using a technology likened to "mini force fields" to independently control individual microrobots operating within groups, an advance aimed at using the tiny machines in areas including manufacturing and medicine. "The reason we want independent movement of each robot is so they can do cooperative manipulation tasks," he said. "Think of ants. They can independently move, yet all work together to perform tasks such as lifting and moving things. We want to be able to control them individually so we can have some robots here doing one thing, and some robots there doing something else at the same time." Findings are detailed in a research paper appearing this month in the journal Micromachines. Postdoctoral research associates Sagar Chowdhury and Wuming Jing, and Cappelleri authored the paper. "The robots are too small to put batteries on them, so they can't have onboard power," Cappelleri said. "You need to use an external way to power them. We use magnetic fields to generate forces on the robots. It's like using mini force fields." "We need to know, if a robot is here and it needs to go there, how much force needs to be applied to the robot to get it from point A to point B?" Cappelleri said. "Once you figure out what that force has to be, then we say, what kind of magnetic field strength do we need to generate that force?" The microbots are magnetic disks that slide across a surface (shown in this video). While the versions studied are around 2 millimeters in diameter - about twice the size of a pinhead - researches aim to create microbots that are around 250 microns in diameter, or roughly the size of a dust mite. In previously developed systems the microbots were controlled using fewer coils located around the perimeter of the "workspace" containing the tiny machines. However, this "global" field is not fine enough to control individual microrobots independently. "The approach we came up with works at the microscale, and it will be the first one that can give truly independent motion of multiple microrobots in the same workspace because we are able to produce localized fields as opposed to a global field," Cappelleri said. "What we can do now, instead of having these coils all around on the outside, is to print planar coils directly onto the substrate." The robots are moved using attractive or repulsive forces and by varying the strength of the electrical current in the coils. "You can think about using teams of robots to assemble components on a small scale, which we could use for microscale additive manufacturing," Cappelleri said. "So far people have been good at making MEMS devices containing different components," he said. "But a lot of times the components are made from different processes and then have to be assembled to make the final device. This is very challenging. We can instead assemble them with our robots. And on the biological side we might use them for cell sorting, cell manipulation, characterization and so on. You could think about putting the microcoils on the bottom of a petri dish." Microbots equipped with probe-like "force sensors" might then be used to detect cancer cells in a biopsy. "Cancer cells have different stiffness characteristics than non-cancer cells, and in some of our previous work we put force sensors on the end of these robots to figure out which ones are stiffer than others," Cappelleri said. The coils were made by printing a copper pattern with the same technology used to manufacture printed circuit boards. They can be scaled down from their current size of about 4 millimeters. A new process, however, was needed to create a microscale prototype, he said. The research is ongoing. The team will attempt to use microscale prototypes to assemble components for MEMS devices. One potential obstacle is the effect of van der Waals forces between molecules that are present on the scale of microns but not on the macroscale of everyday life. The forces might cause "stiction" between tiny components that affect their operation. The National Science Foundation (grants IIS-1358446 and IIS-1302283) funded the research. In this paper, we have developed an approach for independent autonomous navigation of multiple microrobots under the influence of magnetic fields and validated it experimentally. 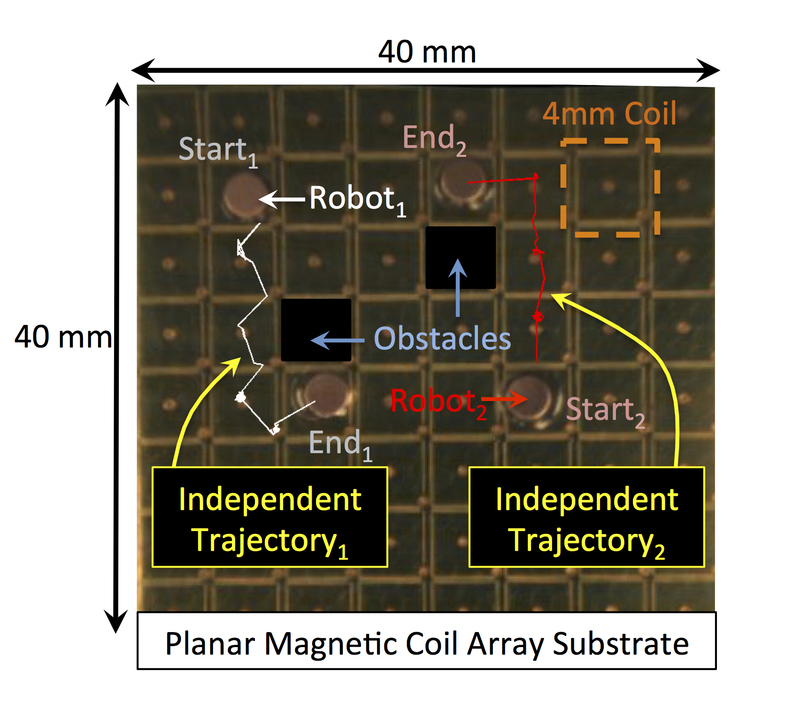 We first developed a heuristics based planning algorithm for generating collision-free trajectories for the microrobots that are suitable to be executed by an available magnetic field. Second, we have modeled the dynamics of the microrobots to develop a controller for determining the forces that need to be generated for the navigation of the robots along the trajectories at a suitable control frequency. Next, an optimization routine is developed to determine the input currents to the electromagnetic coils that can generate the required forces for the navigation of the robots at the controller frequency. We then validated our approach by simulating an electromagnetic system that contains an array of sixty-four magnetic microcoils designed for generating local magnetic fields suitable for simultaneous independent actuation of multiple microrobots. Finally, we prototyped an mm-scale version of the system and present experimental results showing the validity of our approach.